When talking about destructive assholes in our government Trump's name automatically shoots to the top. But, on closer inspection there's someone that has done even more lasting damage than Donny. 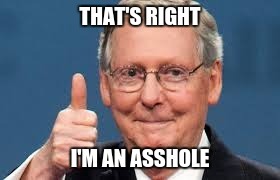 I'm talking about the moron from Kentucky, Mitch McConnell. His accomplishments include inflicting lasting damage to the presidency, the Senate, and the Supreme Court. When the non-partisan intelligence officials discovered that Russia was interfering with the 2016 election they told McConnell. His response, as written in a new book by Washington Post writer Greg Miller, was to threaten them with partisan attacks if they made the news public. He also defended the Russians. The damage that came out of that infamous meeting is incalculable. Then there's the damage McConnell caused in the Senate. It may never be the same after his 10-month-long filibuster of Obama's Supreme Court nominee Merrick Garland. He deeply harmed the comity that was still lingering in the Senate. Finally, McConnell's performance in the confirmation hearing on Judge Kavanaugh was blatantly partisan and ignored all the prior standards of the confirmation process. He managed to get a partisan hack to further infect the conservative leaning of the court. In the Hater's Handbook that all Republicans are playing by these days, McConnell's achievements were like a hat trick in hockey. There's no doubt Trump has been the overt face of racial hatred, and a slew of other bad things. However, when you stack up McConnell's accomplishments, it's apparent he's the most dangerous man in Washington DC.